Galloway Township Police responded to motor vehicle accident on December 2, 2013 at 11:46 p.m. that resulted in one driver having internal injuries. 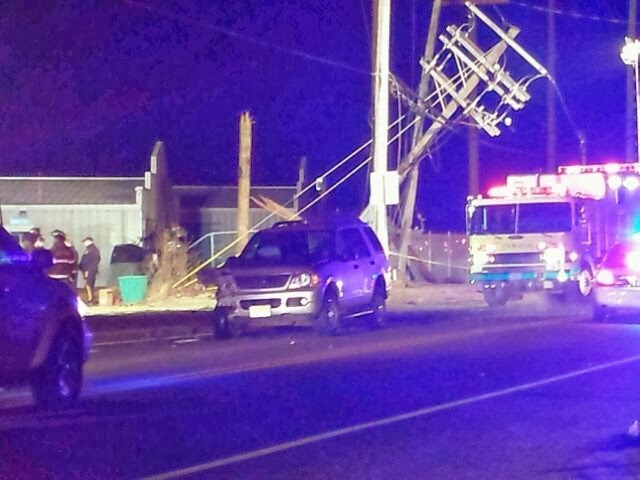 The crash that occurred on Jimmie Leeds Road near the Garden State Parkway entrance knocked out power to over 3,000 residents according to Atlantic City Electric and closed the road for approximately four (4) hours. According to Police, the driver of a 2008 Nissan Altima, Kishan L. Farrar, 30, of Galloway Township was driving west at a high rate of speed on Jimmie Leeds Road near the Garden State Parkway when he struck a 2005 Ford Explorer driven by Alan T. Edwards, 46, of Egg Harbor Township who was also driving west on Jimmie Leeds Road. After Farar struck Edwards' vehicle Farar went off the roadway to the left. He then proceeded to strike two utility poles an electrical box, and a fence. Farar was transported to Atlantic City Medical Center, City Division for treatment and is still hospitalized. According to Police the Atlantic County Prosecutors Office assisted in the investigation. Officer Patrick Neal, Officer Steve Garrison and Officer Kevin Costa are the investigating Officers for Galloway Township.